Today is a busy day for me, our first time to go The Club near One Utama. I still don't know how to go there. There's a charity sales there, look at inai henna on my hands. I got them for RM5 each hand, so both my hands cost RM10. 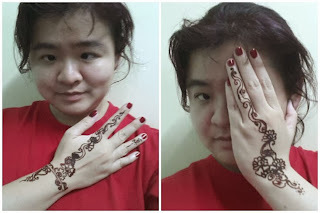 I have different designed of inai henna on both hand. My sister-in-law too has the inai henna done for her hand. Have you tried Inai Henna on your hands? But it's for charity so it's ok, what nail polish are you using? ?